Sometimes a tea happens for a neat reason, or there is an interesting story behind it. Other times a tea happens because it strikes as an obvious need. Stone Cold Cold Killer falls into the latter category. ‘Stone Cold Cold Killer’ was actually our second tea for colds, flus, and other respiratory issues. However, it has a far more generalized action than our ‘Back to Breathing,’ making it more useful for things that are not centralized in the sinuses. The primary herb in this tea is yarrow. It is a heart and lung tonic, strengthening them as its anti-bacterial qualities clean out infection. 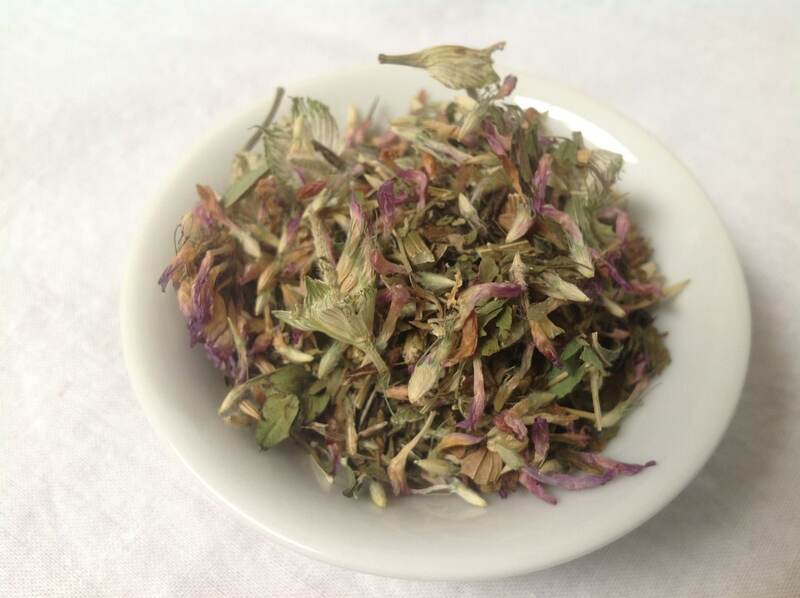 It is a gentle expectorant, loosening congestion and helping to provoke productive coughing. It helps with cleansing in other ways, too, increasing the efficiency of liver and kidneys, and helping the body to sweat out the toxins left by fatigue and sickness. Lastly, yarrow is also a fever-reducer, and can help to cut through some of the “sick blahs” where you just can’t quite seem to think. Red Clover pairs well with yarrow, as the two share some beneficial effects. Red Clover has anti-bacterial properties, which aids yarrow in fighting infections. Similarly, Red Clover is an expectorant and detoxification agent, supporting the cleansing and clearing effects of yarrow. 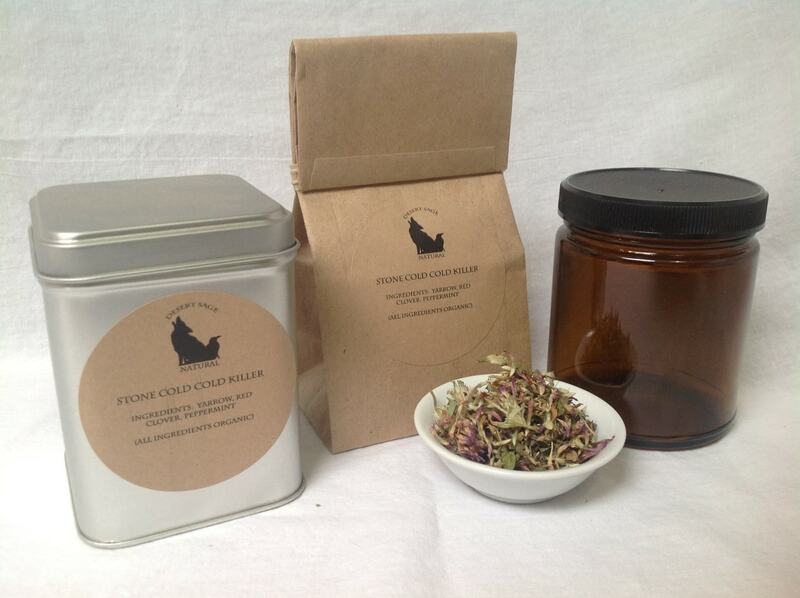 Red Clover also helps to ease the aches and pains of a cold or flu. Lastly, the nutritive potency of Red Clover gives the body a good foundation for recovery. The last herb in this tea is Peppermint. It is refreshing and revivifying and just tastes good. It is actually a mild stimulant, and can be used as a healthier alternative to coffee. Instead of being a stimulant that can leave you feeling more tired and drained when it wears off, peppermint actually acts as a tonic, strengthening the systems that it effects. Peppermint is also one of the best options to reach for when treating nausea, and most colds come with at least low grade stomach upset. The peppermint and clover between them cover the slightly bitter taste of the yarrow, falling in line with our philosophy of creating medicinal teas that you will want to drink. This tea is one of our constantly on hand teas, here at home, and is one of the group that have allowed us to mostly skip being sick for years. I cannot remember the last time I used NyQuil or similar medicines. This entry was posted in Medicinal Teas and tagged Colds, Congestion, Coughing, Desert Sage Natural, Flus, Organic Peppermint Tea, Organic Tea, Tea for Illness by DesertSage. Bookmark the permalink. I’m not afraid anymore to catch a cold now ~ Thank you Kei-Hawk! This is my second purchase and my husband and I are now believers in Desert Sage’s tea! It really works and couldn’t ask for better service.